Just because a story is about children doesn’t mean it’s only for kids. 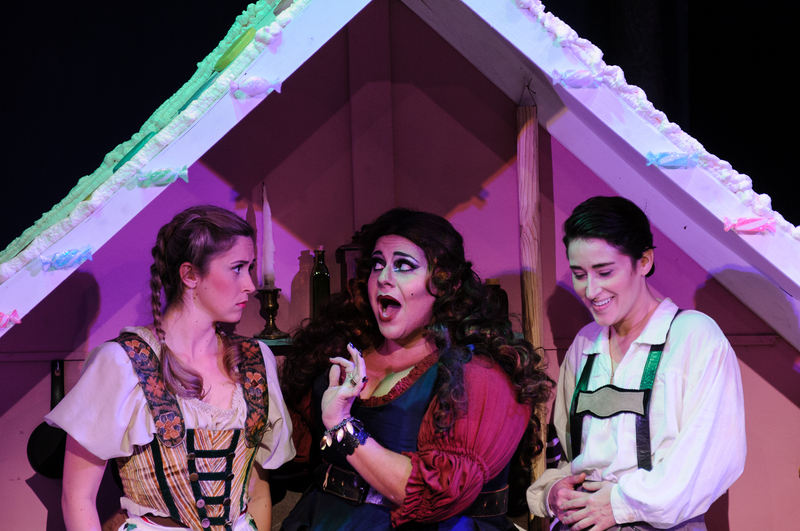 Opera in the Heights’ production of the Engelbert Humperdinck’s 1893 Hänsel and Gretel (with libretto aptly written by his sister, Adelheid Wette) is a marvel. With singing this good, Hänsel and Gretel is no trifle. No doubt this opera was a success because of many talented people, but Artistic Director and conductor Enrique Carreón-Robledo has truly outdone himself here, particularly with the score. It’s supposed to be for a much larger orchestra, and the parts are difficult. But the sound was full and vibrant. More than once I watched the violinists’ fingers scatter across the fingerboard to pull off Engelbert’s perilous arpeggios with total adeptness. And my hat goes off to cellist H. P. Scott Card who played some astoundingly graceful solos with genuine poise. And where to begin with the Emerald Cast’s singers—all of whom were excellent? Singing the plucky part of Hänsel, Hilary Ginther proved a gifted mezzo-soprano with a knack for comedy. Her voice, even in the cross-gender role of a young boy, has an impressively pure timbre—accurate and daring and exciting to listen to. Soprano Katie Dixon as Gretel complemented Ginther with a certain sweetness that I expect blossoms into something quite rich and golden when in a more serious, adult role. As the parents Gertrud and Peter, soprano Cassandra Black and baritone Brian Schircliffe exemplified an ideal combination of light humor and profound talent. As the only male voice against a cast of women, Schircliffe’s hearty baritone particularly soared over the stage. Stage Director Mary Birnbaum, finally, was a real catch for this production. It’s unlike anything I’ve seen from OH before. The set, by Robert Roldan and Joshua Slisz, was bare but tasteful. Wispy pines, accompanied by an ethereal mist, set the magical mood of the fairytale. Walls rolled around cleverly to turn the forest into a charming gingerbread house. And the period-piece lederhosen costumes, by Dena Scheh, were right on the mark. Introducing the opera, Executive Director Allison Hartzell said, “This children’s chorus will knock your socks off!” and she wasn’t kidding. The seventeen-strong choir from HITS Theatre strolled out and delivered beautiful singing. And they were visually delightful to boot, not only because of their gingerbread outfits, but also because of some smart blocking. I admit that I was surprised by this performance. It’s utterly fantastic. There are only two more shows—one tonight and one Sunday afternoon. Go see it. For tickets and other info, visit Opera in the Heights’ website.